Claro Runners have been competing afar in the last 2 weeks. 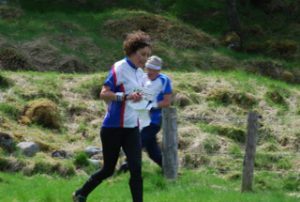 Over the weekend in Balmoral at the British Champs, and for some reason the Queen wasn’t there to welcome them, Ruth Ker was 10th on W50L, Mike Hind was 19th on M65L and Liz Potterton was 24th on W60L. Combined as Claro’s Scottish Adventurers they were 19th in the Ad-Hoc class on Sundays relays. 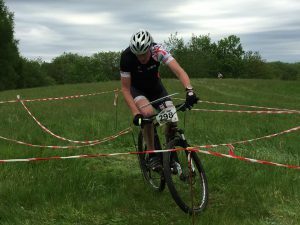 The previous week Tim Evans was at the annual MTBO camp in Denmark, his best results were 9th M55 in Camp Cup race 3 and 16th overall in the Hoker the final ultra long race. The picture is from the crying mile. This event had 20 controls a course length of 1 mile and a map scale of 1:1666, this was part of the evening entertainment. CLARO are organising an Urban event this Sunday starting from Henshaws, where I am advised there is also an excellent Cafe. Ruth Ker has planned some excellent courses. A newly updated map at 1:4,000 has been prepared with additional parts of the town centre and Conyngham Hall that have not been used before. There are excellent opportunities for off-road junior courses. This event has a castle, river, railway, bridges, ginnels, steps…… Full details are on the website here. I hope to see many of you there. NATO are organising 2 events on the 9th and 10th June in Morpeth details are here. The first event is on Saturday afternoon and is the British mixed sprint relay. We already have one team and we would like a few more, teams are of 3 people and must have at least one man and one woman. If you are interested please can you e-mail Ruth so she can collate teams. Entries close 3rd June. As agreed at the latest committee meeting the club will contribute to the entry fee. No sooner have the winter blues subsided that we start to think of the next series of events the Spring Flowers. These will be like last year with limited SI boxes. . We are also looking to have a meet up after each event. The Next event is Wednesday 30th May at Harlow Hill.